I'm still sick. And it may not be swine flu. How is it even possible that I'm still sick? I have like a sickness marathon. If I was my friend K, who runs marathons on the regular, I'd run circles around this illness. Eh, she's in such good shape, she probably wouldn't have even gotten sick. Anyway, this is totally unacceptable; I mean how many Gilmore Girls re-runs can one person watch? Actually, really a lot. But even I have to draw the line somewhere. The truth is that my sickness is probably partially my fault: as my family always sighs, I don't take good enough care of myself. I just find all that excess sleep boring. I guess I just never quite got over that feeling of lying awake in bed as a kid, while you listen to your parents' dinner parties and wish you too could be hanging out. I just don't like to miss the action. All that exciting action on the couch with Andre. 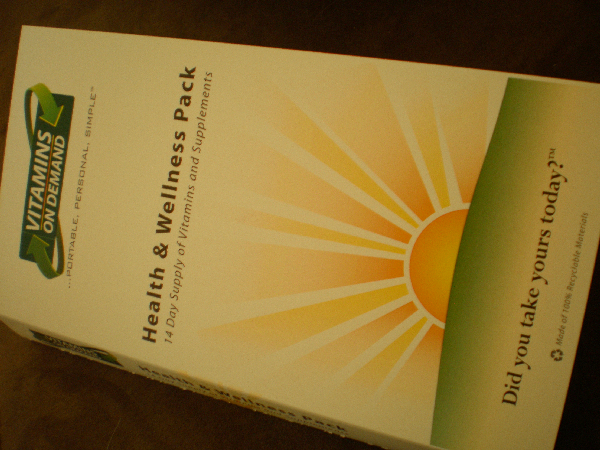 Still, for two days last week, I was wise enough to take my daily dose of customized vitamins from the Health & Wellness Pack that fortuitously appeared from Vitamins On Demand. Really, there isn't anything that's not "on demand" these days: Pay Per View (thank goodness), TV shows, chic disease prevention masks. Oh, wait, that's "in" demand. Wait, is that a brilliant business concept or what? I'm so going to start making gold lamé disease masks (you know, for evenings out). Anyway, the vitamin thing is always a bit overwhelming to me. Like most of the population, I suspect, once a year I buy multivitamins, pledge to take them each day and then completely forget I ever bought them until I discover the bottle in the back of my medicine cabinet six months later, sadly past their expiration date. And I also have trouble keeping up with the trends: fish oil vs. vitamin E vs. cod-liver-hair-of-the-dog-that-bit-echinacea oil. So, these Vitamin On Demand-type pre-created combos work for me because, well, you don't have to do any work. Also, it's harder to forget when you're taking like ten pills a day. Anyway, I started to feel better after those two days of vitamin dosage, so, like any mentally ill person, I stopped taking them. Duh. Okay, so now that I quickly got sick again, I'm back on board. 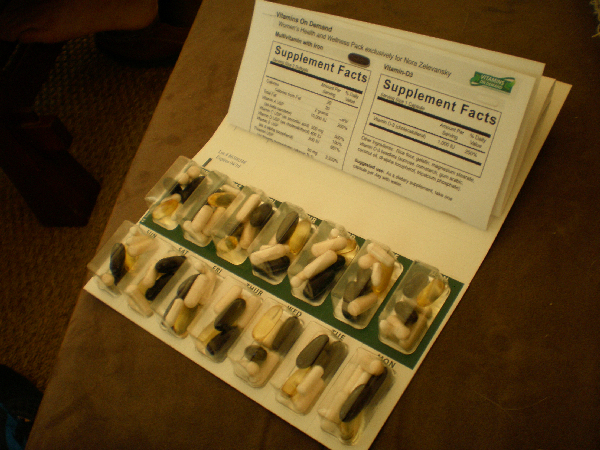 I guess whether you have Swine Flu or run-of-the-mill flesh eating gangrene, it's good to take vitamins. I know it makes me feel virtuous. I'll let you know if it helps, but, even if it doesn't make me healthier, I'm pretty sure my hair is going to be much shinier. Also, anyone who knows me knows I love a pill box like any good grandma and this is like the ultimate little pill box. Plus, these vitamins keep my family from complaining that I don't mind my own health well enough, even when I gallivant around town eating cheeseburger tacos when I should be in bed. So, I can go to that metaphorical dinner party in the sky any day. Even if I'm coughing Oink, Oink flu all over the other guests.